Getting our code reviewed by a pro is a great way of improving code quality but what happens if you don't have access to a rockstar programmer? You do the next best thing and grab a 'lint' for that language. Today, I'd like to talk a little about CSSLint, a recently released code analysis tool for, you guessed it, CSS. Join me after the jump! Created by Nicholas Zakas and Nicole Sullivan, CSSLint is an open source tool that checks your syntax against a set of predefined rules to root out possible inefficiencies and make sure that your presentation works as expected with little surprises. 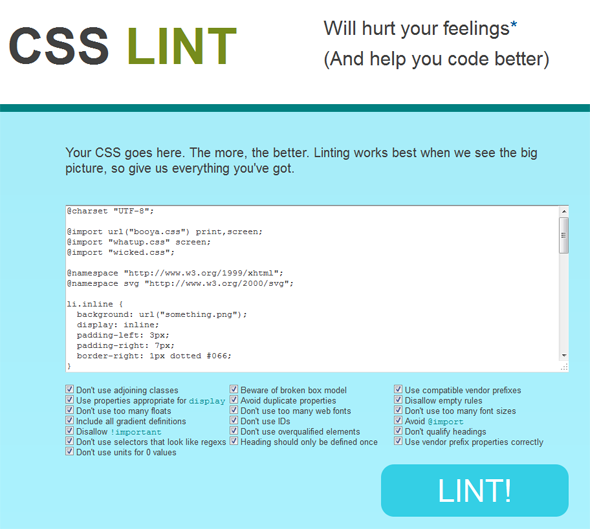 All the rules behind CSS-Lint and their full reasoning and description is all for you to read out on Github. Looking to run CSS-Lint as a Grunt task?